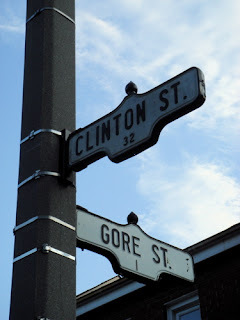 This famous little intersection is just around the corner from my apartment. It pre-dates that famous political duo by at least 50 years. The Taste of Little Italy festival starts tonight at 7pm. College Street will be closed from Bathurst to Shaw. All the restaurants have snack booths and there's live music, too. You should come, walk around, see what's going on. Call or mail me if you're going to come down tonight.